The Simpro Crate Wizard is designed to provide a quick, easy and safe method of lifting and moving stacks of crates (‘Bread Crates’) as well as building and breaking down stacks of crates. 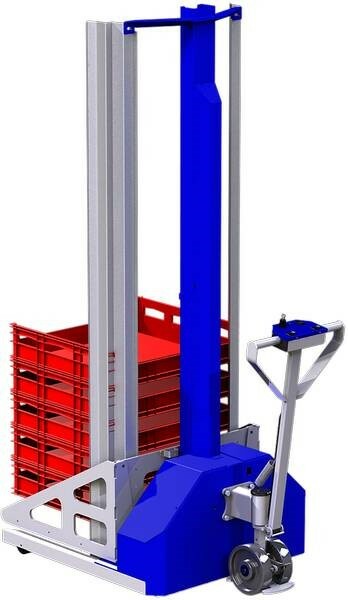 They have a weight capacity of 150kg and are designed to handle stacks up to 12 crates high. They are very easy to move and steer, even with a full load of crates. The crates are picked up by 2 arms which straddle the crates, and have an electric actuator to move them in and out. Adjustable guides are provided to ensure the crates stack properly onto each other. The arms also have adjustable pins to pick the crates up; these can be moved if needed for different styles of crate. The lifting power for the Crate Wizard comes from a battery-powered hydraulic power pack. When the “Raise” button is pressed, the motor runs and hydraulic oil is forced under pressure into the lift ram, causing it to extend. The ram spear has a roller on the top; as it extends, a chain is pulled up around the roller, which lifts the arm frame. When the “Down” button is pressed, a solenoid valve opens and the hydraulic oil flows back into the tank at a controlled rate. The arm frame is not powered down – it comes down by gravity alone. The whole action is smooth and efficient, and requires little or no maintenance.